Oddly enough, as I recall, I DID have some associations with the name Ina Claire. I guess I had read some theater memoirs in which her name repeatedly came up as the supreme technician of high comedy onstage, who liked to pass along her knowledge (pitch it this way, pace it that way) to junior members of the cast. 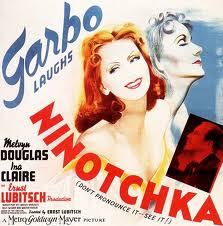 So it's kind of a kick to see her with Garbo, who was a similar mistress of the film medium. I hadn't remembered how vivacious Ina Claire was. She was fun!